Our unisex shirts are printed on Bella+Canvas. They are pre-shrunk, 100% cotton. The unisex tees are sold in standard men's sizes. Women will typically need to order one size down in these tees for a fitted look. A suggested conversion for women is listed below. 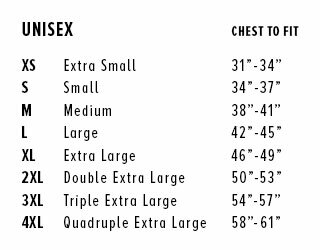 Unfortunately, we do not offer Unisex XS. Our long sleeve unisex shirts are printed on Next Level. They are pre-shrunk, 100% cotton. Our unisex pullover hoodies are printed on softspun Fruit of Loom or Gildan. They are pre-shrunk 60% cotton, 40% polyester. "Before applying your patch wash and dry and garment (if applicable). Set the iron to a hot cotton setting. Place the patch in desired location and cover with thin piece of cloth. Iron and apply firm pressure on the patch for 25-30 secs. Iron oppositie side of patch for same amount of time to reinforce. When washing turn garment inside out. You may also use fabric glue, we recommend a thin amount of E6000 or alike before applying heat at 20-25 secs each side. If using glue, please wait at least 3-4 hrs before wearing garment"
Drying: Hang-dry if possible or tumble low heat.